A new day, a new town! We left Quartzsite this morning shortly after nine. Terry called to me from outside the motorhome while he was breaking camp. Our front curtains were open and as I looked, I thought, "Where did all this fog come from?" Well, tweren't no fog. . . it was a SANDSTORM. Wow. One minute you are sitting out and there isn't any wind at all and then the next minute, wind and a sandstorm! It looked totally white out our front windows. Didn't last long. There were a couple more incidents, but none as strong. I'm thinking. . . is this a good travel day? 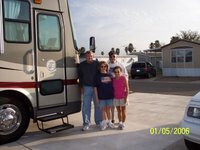 But we did leave and arrived in Yuma at the Fortuna De Oro RV Resort around noon. 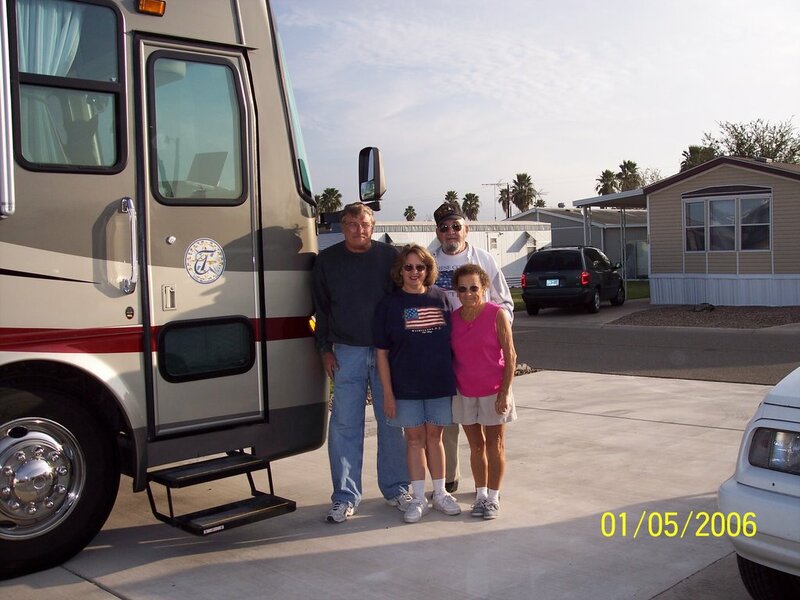 We set up and visit with Mickey and Patti who had been part of our group in Quartzsite. There are across the street from us and great friends. We visited for awhile, then Terry and I left. We found the LabCorp and he got his monthly blood work done, then we dropped off some prescriptions at Walgreens. Will go back and pick them up tomorrow. After getting back home, we washed our bikes down and hope to get a chance to ride them some time while we are here. We are here for a month. Signed up for that long because it is a very nice park, 2 pools, and exercise room, etc., and best of all. . . full hookups. 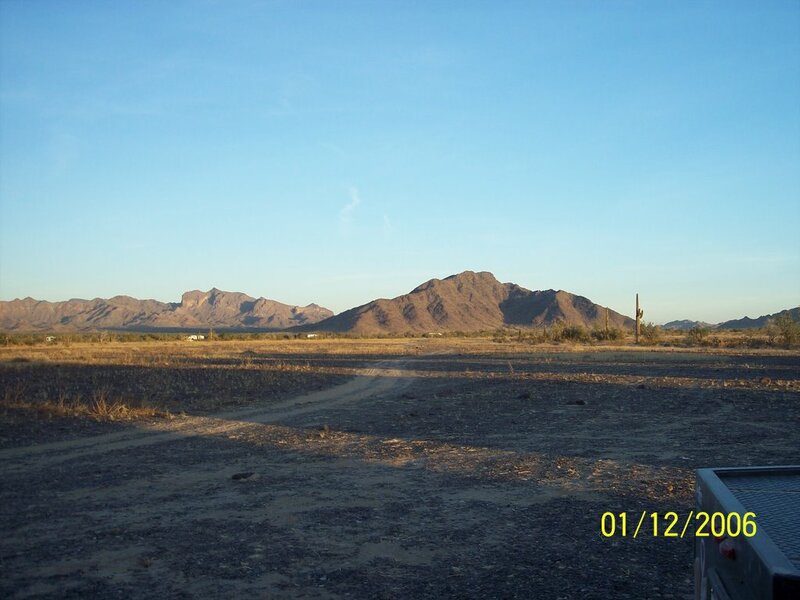 Plan to spend some time here, see the sites and enjoy the weather, which is warmer than it was in Quartzsite. 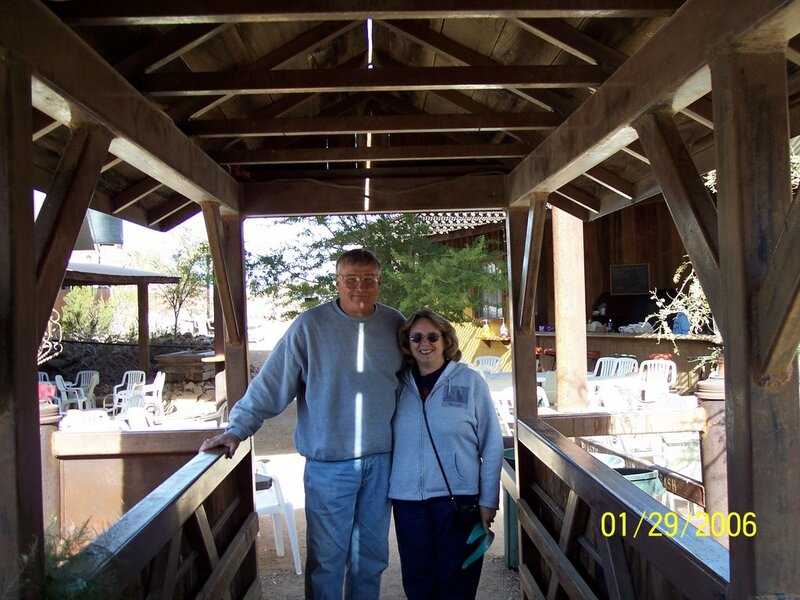 We drove to Ehrenberg, Arizona, this morning to get our mail. It arrived as well as the new meds for Neal, our seizure Scottie. So tomorrow we will be heading out. 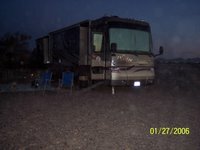 Planning on going to Yuma and spending some time there in a full-service park. We want to take some time to wash the rig inside and out, the car inside and out, the dogs. . . well, outside at least. 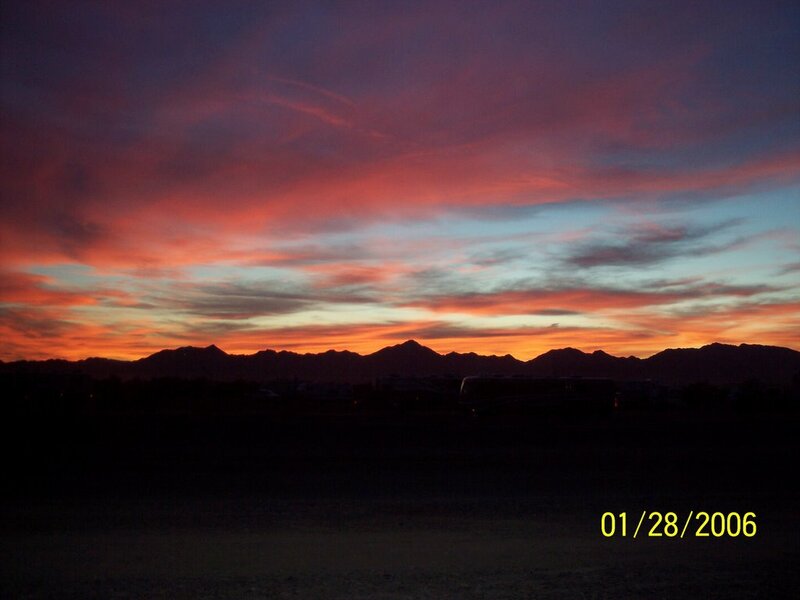 It has been a real experience here in Quartzsite. Glad we came. Don't know if we will come again next year. They bill this as the best flea market, but it cannot hold a candle to Shipshewana. They say Yuma is a lot better. And a lot of people enjoy shopping at Algodones, Mexico. They say it is a very clean border town. The RV show here was not very good. Again, we find more interesting info at the Indianapolis boat, sport and travel show. But it is something to do and as I said before, we are glad we came. If we come again, it will be to rally with our friends again. Today we drove up to Parker to take in the casino. After losing $4 in 5 minutes, we took off. No point in hanging around there. Didn't even get to spend an hour losing it. 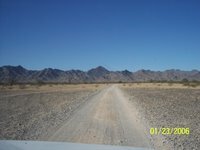 We headed out of town to find the "dirt road" which leads to the Nellie E. Saloon, aka, the Desert Bar. 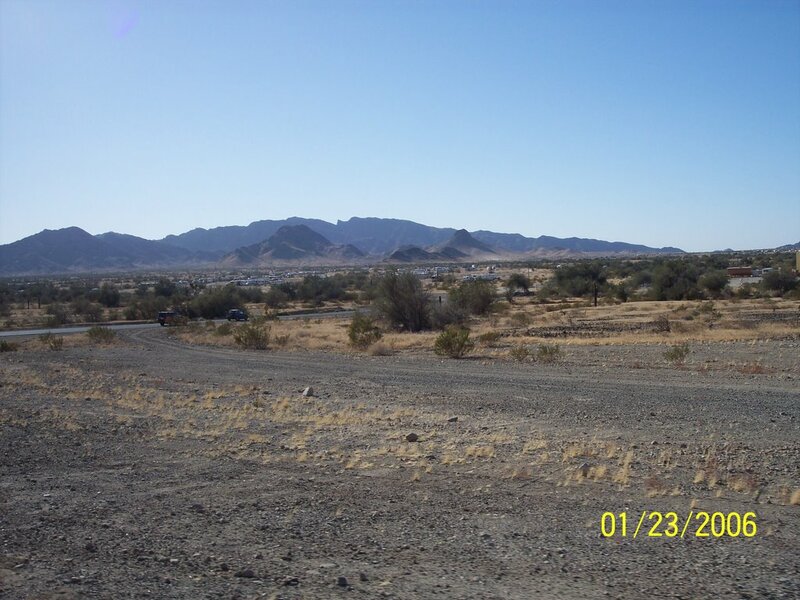 It is out in the desert on the site of an old abandoned gold mine. Some dude bought the property and for some strange reason thought this would be a good place for a restaurant. It is totally solar powered, with very few amenities and plenty of dust and cats to go around. It is, what shall I say. . . . an experience. The fare is pop or beer and the menu is hamburgers (no cheese as that would require refrigeration), hot dogs, chips or chili. We were there when it opened (only open Saturday and Sunday from noon to six). Got our food, actually quite a good burger, hiked a little to get a view from the top of the hill and took a lot of pictures. Before we started back out the 5 mile long desert dirt "road," we let some air out of the tires. We had a much smoother ride that way and there is less risk to damaging your tires on the rocks. We drove around Parker, Arizona, to see what was there. Not a lot, but I find these towns interesting. Once back we just hung around the campsite. Later went over to Tab and Deanna's and had fresh baked blueberry pie a la mode. Mark (another 2005 class member still with us) joined us. It was delicious. I have a couple pictures of sunrises and sunsets I will try and post. Well, over half our group has moved on and all our seminars are finished, so the rest of us decided to leave the dust bowl three miles out and moved to 3/10 mile in from the gate. We really have a nice spot, but we are right off the road and since we are so close to the gate, there is a lot of traffic. But then, most of us are not planning on staying much longer. We are here until Monday when we get our mail. But we are waiting on meds for our seizure dog, Neal, so we might be here a little longer depending upon when his meds arrive. It is a lot more crowded up here. We just had NO ONE drive by our camp in the dust bowl. If anyone came back there, they were either looking for us or lost. We ran out of water this morning, so we filled up on the way to our new site and got set up then. We drove in to the show later and bought a trucker antenna and booster for the cell phones and the air card. It is supposed to help us get out further if we are in an area with weak cell phone service. That is important to us, although we just had one area in Texas so far that proved to be a problem. The weather is turning a little warmer. It has always been very sunny and the sun is warm, but warmer temperatures are sure a welcome relief. I hope the rise in temps continues. We might do some more grilling outside, which we haven't been doing. Not sure what we will do tomorrow. . . that's what's nice about being retired. It has been a week since I have posted. Boy, time sure flies when you are retired. We have spent every day doing something different. Last week we were watching people come in almost everyday as our group grew and grew. I think we ended up with some 30+ rigs and this spot out here in the desert was looking like a small city! We have not enjoyed the best of weather. It hasn’t rained, and that is a blessing, because with all this dust, it would be nothing but mud. It has been sunny every day, but cold. We have had some low temperatures in the high 20’s and afternoon temps no more than 60 with wind. We have had wind most every day. When it is really strong, it really kicks up the dust and then we are miserable. 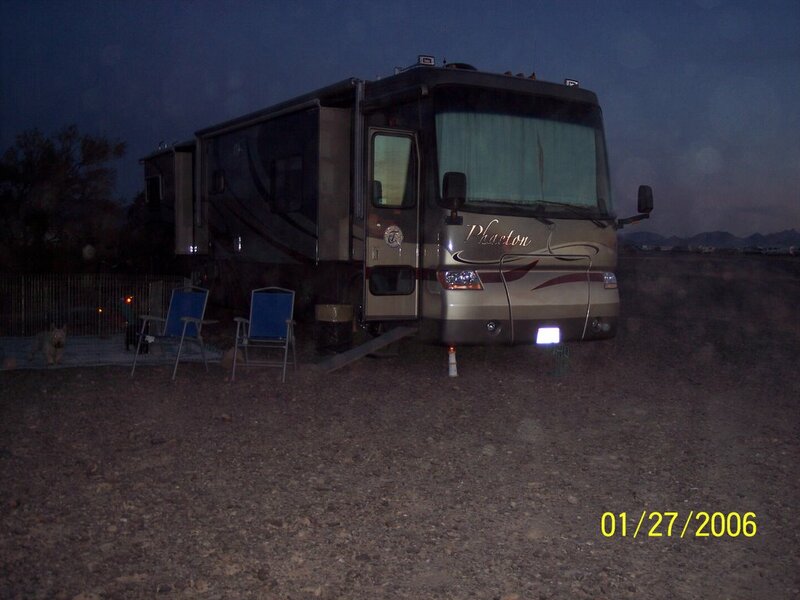 So we have been hiding out in the motorhome or running over to Blythe, California. Blythe has an Albertson’s which is the best market around. Nothing in Quartzsite to speak of. You think they would at least put in a decent grocery store. 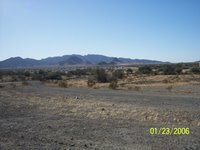 Monday we drove over to Ehrenberg to get our mail and then on over to Blythe. We took “53rd Street” which is not actually a street. 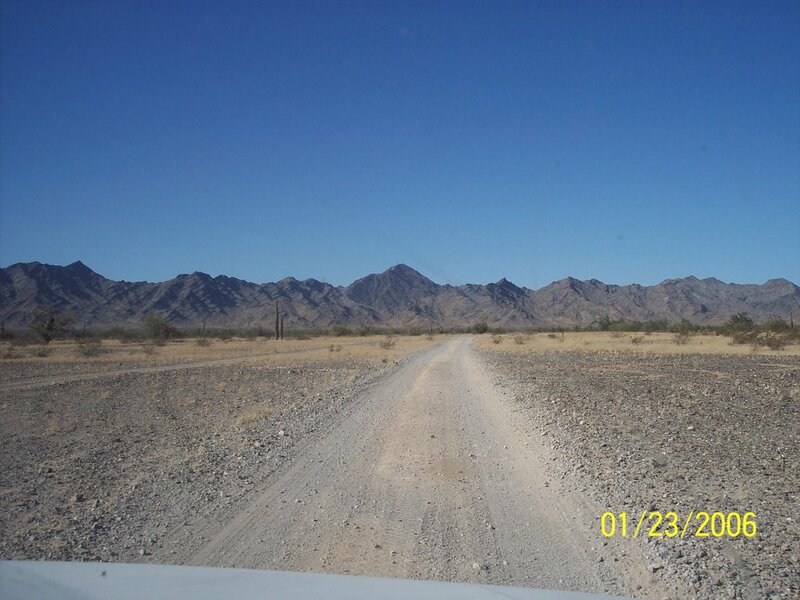 It is supposed to cross “Old Yuma Road” which is not really a road. What we found ourselves doing was “off-roading” out in the desert trying to get from point A to point B. There actually was a dirt road . . . well, more of a path. Went past an old mine shaft at one point. 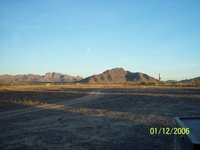 Never lost site of Quartzsite, so wasn’t worried. It was really kind of neat running out in the desert. Very pretty and close to the mountains. We went past the area known as Dome Rock. It is called such because the one mountain (actually a very large hill) has a cap on it that sort of resembles as dome. Yesterday we finally went to the RV show. We had planned on going every day, but it was very crowded and traffic was backed up for miles, so we waited to go. We drove up 95 and went into the next LTVA (long term visitor area) to the north of us, did some more off-roading up to the wash (dry creek bed) and parked quite close to the tent. It was the best option because the parking lot fills by about 7 a.m. The show doesn’t start until 9 a.m.
Today we went back and bought a couple items we looked at yesterday. We parked in the same place and then went straight in to where the items were and bought and came back out. They were large and bulky, so we chose to do it today having seen everything yesterday. We then went for pizza at Silly Al’s. The pizza was great, was there was nothing silly about poor service. The food was almost cold when we got it. We have had several campfires. We are able to do that here. I was surprised, but then there really isn’t that much to burn. There is a lot of rock here and as you walk and walk on it, dirt comes up to the surface. The dirt is like talcum powder. It is very fine and sticks to everything. We had some musicians around the fire tonight who played some pretty fine music. It was very enjoyable, but as with most evenings, it started getting really cold so I came in. Tomorrow we may take in some other of the flea markets around. Terry still has a couple things he is looking for. Well, we have survived the wind. Man, oh man. Sunday the wind started blowing and it got downright nasty. Just straight wind, but as nightfall approached, we started getting a little anxious about stuff blowing around. So we went out and laid down the bikes and the lawn chairs and eventually the dog pen. 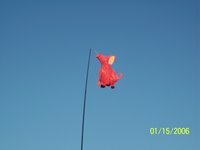 And poor little Phaeton the Pink Pig (windsock) was just getting bounced around so badly we were afraid we would lose him. So up the ladder I went to take off the bungie cords and we brought him in to safety. Later on after we went to bed we kept hearing more banging around outside and so we decided to pull the slides in on the windward side. It would make it less area to heat anyway and the slide toppers would get a rest from the wind. I eventually discovered the source of the banging was the dryer vent on the back end of the coach, so there was nothing to hurt there anyway. The wind continued until Monday evening and then it subsided. 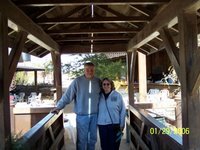 Yesterday we went into Blythe, California, to the drugstore so Terry could get a prescription and to get a few groceries at Albertson's. The groceries in Quartzsite are a little lacking and very high prices. 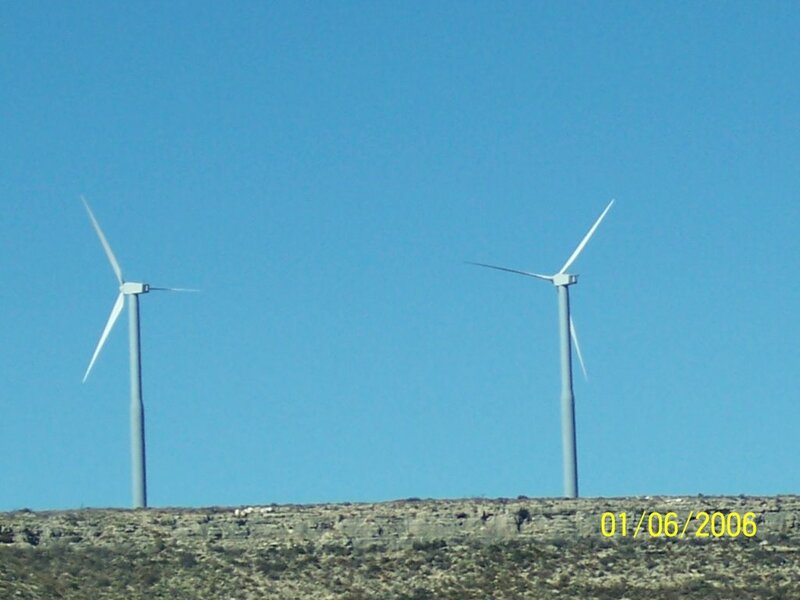 We have spent a lot of time looking at the wind chargers. We had planned to add solar, but with 2 generators, we don't think we need the panels. The generators do fine and are easy to deal with. The wind charger would be simple as well, but we just aren't sure we even need it. We do like boondocking. It is fun and goes quite smoothly. Terry did spend an afternoon getting our catalytic heater going. We don't have a place to mount it in this coach, so it is on legs and we can move it around. I don't like that as well, but I sure do like the heater. It heats up the coach, uses no electricity and much less propane than the furnaces. We have been closing off the front of the coach at night and putting the dogs in the bathroom. They have more room there and then we have a gate we put across the bedroom to keep them contained. They can see us, but have their own space. It is working very well. That way we only run the back furnace at night. We don't run the catalytic heater during the night. Neal had another round of seizures Monday, but we managed to get through with just 3 in 12 hours and that was it. Hope they stay away. Pretty tough ones, but he seems fine. I am boosting his one med just a little. Makes it harder for him to walk, but he should get used to it and do fine. Certainly don't want him having those seizures. We have done some walking around at the flea markets and while they are fun, they aren't as good as what I expected. But I guess the Shipshewana flea market has just spoiled me. And when you are confined to 300 sq. ft. of living space, you don't buy a lot of knick knacks, that's for sure. But that's okay. Most of what I have bought so far has been shirts. Terry bought a hat the other day and it looks good on him. We have a bunch more rigs due in here by the weekend. The rally actually starts the 21st, I think, so most everyone should be in place by then. This place called Quartzsite is really beginning to hop. 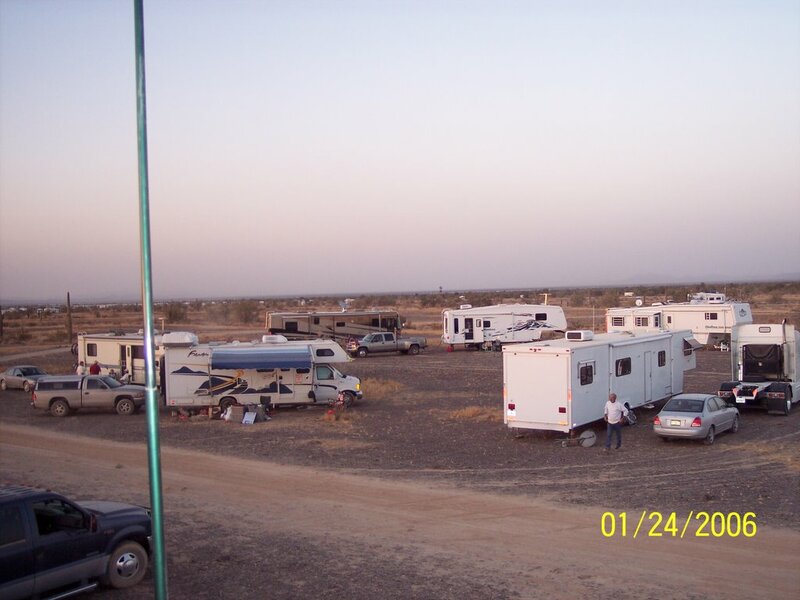 The desert where we are parked is getting much more crowded, although there is no shortage of space. It's just that there are more rigs filling in the spaces which were empty. Stopped to talk to a lady today as we had noticed they had Elkhart County plates on their car. Turns out they are from Goshen and live on Greene Road, where we lived for several years. 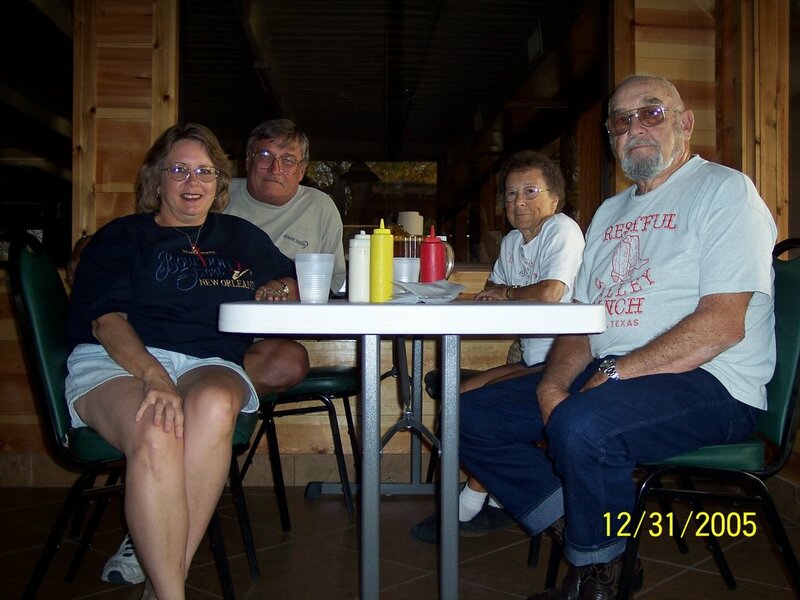 Their last name is Essig and her husband is a cousin to a man I graduated with from high school. Oh my, what a small world it is. We spent the first two days here scouting out various flea markets and buying parts for Terry to plumb the catalytic heater in the new rig. It is done and we are toasty warm. The furnaces have been keeping us warm as well, but the heater runs on far less propane and conservation in the key when you are boondocking. Boondocking is when you are "camping" without any hookups. We have 2 generators, one diesel and one gas and the catalytic heater, large holding tanks, and plenty of fresh water, so we are doing fine. I did think it would be warmer here. But the first 2 days it was quite warm during the day and cooler at night. Today was a little cold, although to some of you 50 degrees would be warm. And then tonight the wind has kicked up and blowing pretty hard. 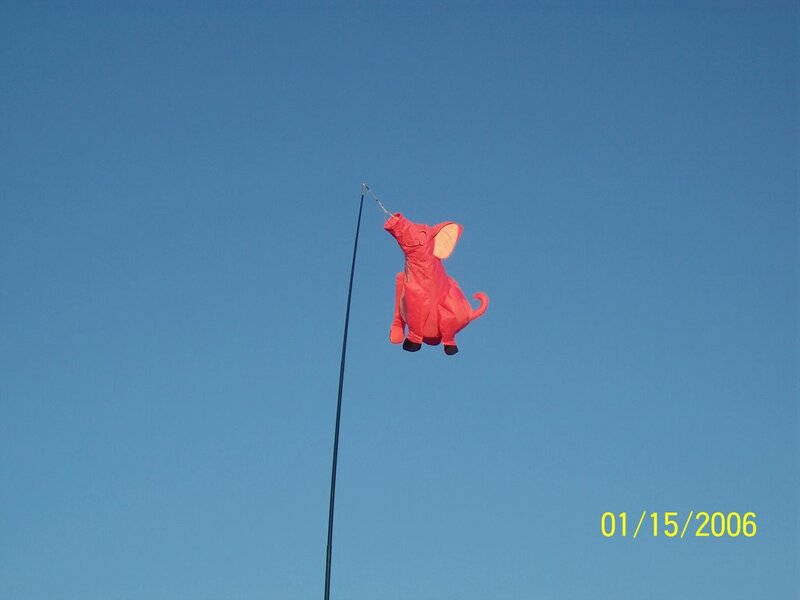 We have a flying pig wind sock and we are thinking it might need to come down, but that involves me getting up on the ladder and Terry doesn't think I need to do that. I love Arizona and I love the desert. It is pretty cool out here. Today I was in the front recliner and had my book and opened the curtains at the front window and read some and watched the desert with the mountains in the background. I think it is much warmer in the Rio Grande Valley, where Mom and Dad are. We may decided in future years to spend more of the winter down there. It is warm weather we seek more than anything else. But it is fun here in Quartzsite with other friends from the "Fulltiming Graduating Class of 2005." There are 7 rigs here and lots more coming in next week. We have a total of 40 that are supposed to be coming in for the rally the 21st-29th. There will be no shortage of fun and activities, that's for sure. We are in Quartzsite, the Big Q. Arrived here shortly after noon. We are here with Mirada, Pull-Tab, RV Notebook, PB&J, and a few others. We have about 6 rigs so far. Expecting 40 altogether. We are getting ready to go into town, so I will have to post more later. Just wanted to let everyone know we have arrived. There are so many rigs here, I wonder if there is anybody anywhere else? Well, we had thought we would spend another night in Deming, New Mexico, but 13 degrees is a bit cold for us. We didn't like that one bit. The guy next to us had left his water hose connected and it froze. He came out to see why he didn't have any water. Surprise! We got here around 4, so we had time to set up and sit out with the dogs for a bit. Grilled out. The air was warm. It had to be close to 80. . . what a change from this morning! The furnaces have still not kicked on. The temperature in here is still over 70. Yay! It is really dark here. The park has street lights at the corners, but it is dark otherwise. Don't plan to do any walking out there, but we will have to let the dogs out one more time. We almost didn't move today. The wind was so fierce when we were getting ready to leave, but we decided to go anyway. Terry took the turn at driving, but we were only going 50 miles up the road to Deming (from Las Cruses) where we had our mail sent this week. We were able to get our mail, so we are planning on going on into Arizona tomorrow. Won't get all the way to Quartzsite, but we will get closer. The weather here is COLD. This is NOT RIGHT. We came out here to get warm! It is supposed to get down to 29 tonight, so we unhooked all the water hoses and the "other" hoses so they wouldn't freeze. We are staying nice and warm inside. The dogs don't want to go out. Bailey lays first on one couch, then moves over to the other. Hah. What a life. Man, this Texas is one BIG state. While camping at the KOA, we met a couple who drove in and quickly made friends. He is a retired Army guy and he has a Vietnamese wife, whom he married while he was on active duty in Vietnam. They were very nice. They have 4 daughters and now have a house in Culpepper, Virginia. 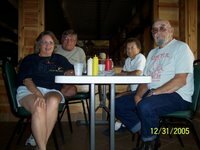 We had dinner with them at the little cafe at the KOA. Talk about a sleeper. They had the most wonderful ribs you could imagine. Just a little dinky joint. We left Ft. Stockton yesterday morning and drove till about 2 p.m. I got the pleasure of driving through El Paso. There was no road construction, so that was a big plus. We are truly enjoying this new coach. Because the engine is in the rear, you don't have the noise up front and we can talk back and forth without shouting. Even the generator, although up front, is very quiet. We stopped at the Camping World outside of El Paso, but didn't find anything we couldn't live without. Finally after 2 days of driving we were close to leaving Texas. We drove on into Las Cruces, New Mexico, and made camp just off the interstate. We are going to be here for a couple days. We went out to eat last night at a Mexican restaurant. It was very nice. We also went down to the little Spanish town of Mesilla. It was very dark, but we are planning on going back today. It is the tiny little town where Billy the Kid was tried for some murders and sentenced to hang. While we were outside the camper, another couple drove up and parked next to us. Turns out he was at the KOA the night before and recognized our coach. They are headed to Quartzsite as well. They left this morning and we are staying here another day. Today was another day of driving. We left around 8:30 and have set up camp just outside of Ft. Stockton, Texas. It is now 3:30. We are actually at a KOA. It is nice and sunny here. It was hot setting up. We have full hookups here so I may get to try out the washer/dryer. The campground is not very full. 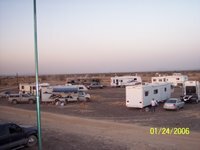 There are some other cheap campgrounds in town. We tried a couple of them, but they were quite crude and one was unattended. Hard to make the turns, etc., so we came back to the KOA. It is right off the interstate, so we have easy access for in the morning. There is a restaurant here, so we may try it. They are supposed to have good barbecue. Everything is going fine. We are still learning how to run this rig. We keep the manuals handy and have pulled them out to see what to do next. Now we are going to have to study how to work the radio. Pretty fancy radio, with satellite radio built in, but we haven’t figured out how to use the regular radio yet. Sorry to report that we took a stone to the windshield sometime earlier. 1825 miles on the rig and we will have to replace it. Darn. We heard it, but it didn’t sound bad and we didn’t see it hit. It hit way up high just below the trim at the top. Terry said as long as it doesn’t go down or to the side, we are going to leave it. 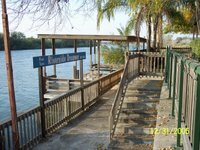 We will make our way back to Red Bay in the spring and get it fixed there. Since this is a 2006, one would have to be shipped. I’m sure no one would have them in stock. We will just keep an eye on it. If it starts to crack, we will call ahead to a Tiffin dealer and have one ordered and get it fixed. The rig is a dream to drive. We are both enjoying the quiet, comfortable ride we are getting. I will be posting this late since we cannot get any cell phone, modem, etc., signals. We left Mom and Dad about 9 a.m. this morning. That was hard because we have had such a great time. We did a lot with them, but mostly we just hung out, played bingo and swam in the pool. Made a couple trips to Mexico and one to South Padre. It is hard to beat southern Texas weather. The past couple days it was close to 90 degrees, but cool enough at night you had to close the windows. Just about perfect. Today was a driving test. First trip in the new rig. We had only driven it 150 miles prior to today and that was down and back to the dealer’s. We headed west on US 83 and are camped just off of it. 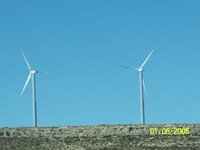 We are headed to Quartzsite, Arizona, for our Class of 2005 Rally and our route today was taking us toward I-10. We drove 325 miles today. While on the road, we saw lots of deer, but we also saw two wild boars. Terry gave them a toot of the air horns and boy, did they ever scamper back into the brush. There were not in danger of getting on the road. They were in the scrub and there was a fence between their position and the road. They sure were cute. 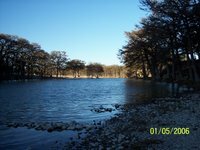 Our camp’s address is Rio Frio, Texas. Hah. It is north of Concan, south of Leaky. US 83 joins up with I-10 at Junction. 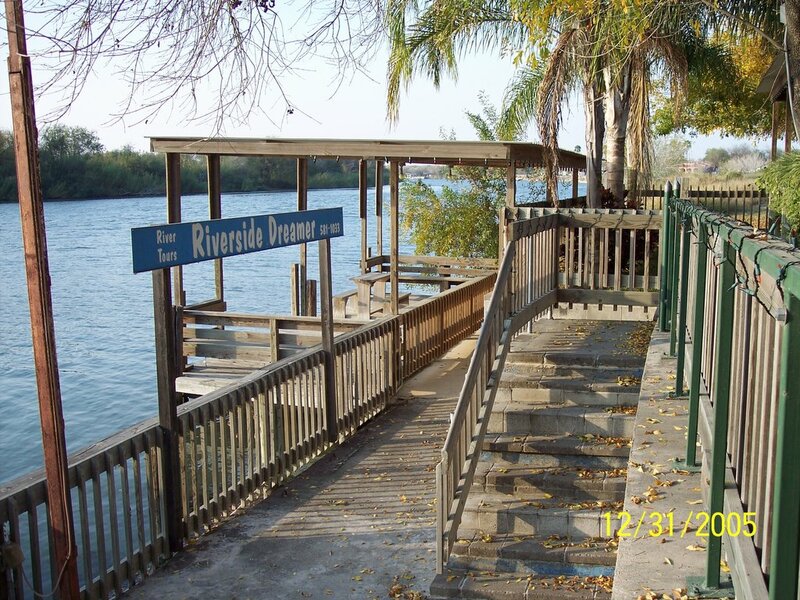 The park is called Parkview Riverside RV Park. It is quite nice. Very nice showers and laundry, a camp store and very gracious people. There aren’t many campers in here, but there are seasonal rates and it is in the mountains. One big mountain looms up over one end of the camp. The river runs alongside the camp and there are several access trails down to it. Surprisingly there is water in the river, something we haven’t seen a lot of this trip. The camp is easily accessible from 83. There is about a 1.6 mile jaunt down a county road which isn’t any too great, but it is smooth and trees are cut back, so we didn’t hit any branches. The park itself is well manicured and the roads are wide. We didn’t have any trouble getting in and getting parked. I went out and took some pictures. Tonight we went out for a walk around the campground and it was already dark. There was some light from the entrance to the park and we could see a herd of deer. We stood quietly and watched as the buck played and frolicked with the does and the babies. It was awesome. We discovered later that there is a feeder in a grassy area near the camp store. It is a safe haven for them and a treat for the campers. We plan to go somewhere close to Fort Stockton tomorrow night. Once we get on I-10, we should roll pretty good. We have some scenic miles to do tomorrow on 83, and while it is in the hill country, it doesn’t appear to be mountainous. . . just hilly. Yep, the plates are here, the mail came, we are getting ready to roll. We are just a few days later than we planned to be, but hey. . . we have no schedule to keep. So today is a work day. Plan to bathe the dogs, do laundry, get the bikes back up on the rack, take one last spin around the park on the golf cart and we are outta' here on Thursday morning. It will be sad to leave Mom and Dad. We have really had a great time here. Been to Mexico twice, went to see Falcon lake, saw South Padre Island, bought a new coach. . .that's quite a lot to pack in during the month. We've had our own space, so we didn't get on anybody's nerves and the dogs had grandma and grandpa to dogsit occasionally. The weather down here has been great. A couple days of rain, a lot of fog and mist in the morning, but clearing by mid day and hot, pool weather. Hope we have good weather in Arizona. Well, I slept in today, so now I must get a move on if I plan to make it to the pool one last time today. Down by the Riverside. . .
New Year's Eve we drove over to the area where Pepe's is and had dinner at the Riverside Restaurant. It is also on the river and they have a boat they use to give river tours. We didn't take the tour. In fact we weren't sure we were going to get dinner. It was about 4:30 and we were the only ones there. They was one older woman who was apparently the only employee and she said they were open and we could get food, but we would have to wait for her to turn things on, etc. She said no one showed up to work. She was turning away a lot of customers. We decided to wait. While she didn't seem to eager to go to work, the tenderloins she fixed were very good. By the time we left, more employees had shown up and more customers as well. When we left we asked if they had just opened up and the proprietor said no, but New Year's Eve Day is always a very slow day. We came back home and later we joined Mom and Dad in their trailer, along with the dogs, and they slept while the humans played cards. We had some snacky stuff and played cards until 11:00 which is when New York dropped the ball for the new year. We then went back home and stayed up until we officially experienced the new year and then went to bed.